The second Rhinegold LIVE Rush Hour concert, curated by Rhinegold Publishing, was held on Monday at Conway Hall in London. Having attended the first concert a couple of months ago, I knew we were in for another treat. Rhinegold established their concert series in order to bring classical music to a wider audience, and with this in mind concerts are presented in slightly different format to a traditional recital; each one commences at the earlier time of 7pm and is fairly short (around 50 minutes), with the added bonus of a drinks reception, and Q&A session at the end of the performance, allowing the audience to get to know the artists. Amazingly, this is all provided free of charge – what a great concept. Andrew Litton was the featured solo artist, in a programme entitled A Tribute to Oscar Peterson. A celebrated conductor, Mr. Litton has always been fascinated with Peterson’s piano playing. He explained how he came to love the Jazz composer’s style, addressing the audience between songs. Witty and informative, Andrew not only entertained with his superlative playing, but also with copious interesting anecdotes, an element which sets this concert series apart. After hearing pianist Steven Osborne‘s performance of a Peterson arrangement at a private party, Andrew asked him where he could find a copy of the music. When Steven replied saying he had transcribed it and other songs himself, directly from a Peterson CD, Andrew asked to inspect the scores. This was the catalyst for a disc of twelve songs which come from seven different commercial recordings spanning four decades of Oscar’s legacy. Andrew remarked that he hadn’t given a piano recital for many years (since a teenager! ), but this was never even remotely apparent from his performance. Numbers such as ‘Things ain’t what they used to be’, ‘Round Midnight’, ‘The Nearness of you’, ‘Take the ‘A’ Train’, and ‘Little Girl Blue’ demonstrated the range and colour of his playing. A rich, warm sound pervaded slower songs, where this pianist’s huge dynamic range commanded total audience attention, especially in the effective pianissimo passagework. Faster numbers were given upbeat rhythmic precision combined with incredibly dexterous swift fingerwork. 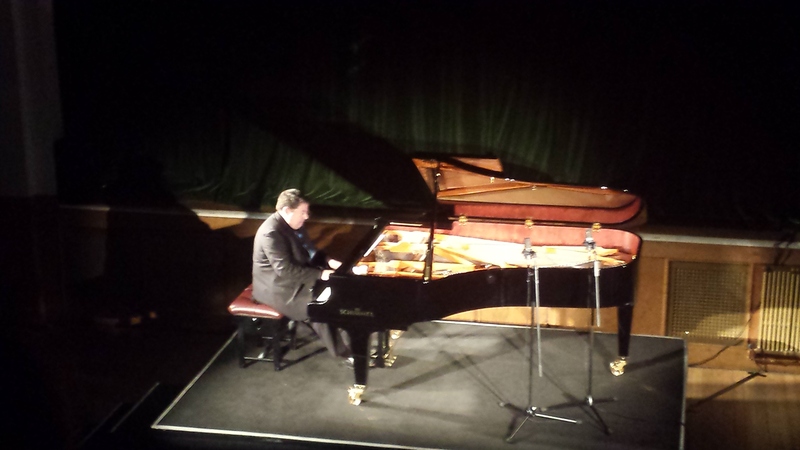 A Schimmel Konzert Grand was provided for this concert (and every concert in this series) by Peregrine’s Pianos in London, and the tonal range and depth of sound from this instrument was impressive. After an encore (‘Somewhere Over The Rainbow’), International Piano Magazine contributor and classical music writer Jeremy Nicholas interviewed Andrew, asking some pertinent questions regarding technique, especially use of the thumbs and hand span required for this genre. If you haven’t yet enjoyed the Rhinegold LIVE experience, the next concert takes place on Tuesday September 9th 2014 featuring pianist Charles Owen, and this will be followed by music for voice and piano performed by Mary Bevan and Richard Peirson on Monday 10th November. See you there!